Need to verify an applicant's employment or income history? Checking to see if a candidate has a criminal history or civil judgments? If you get information from a company that compiles it so you can make eligibility determinations, you must comply with the Fair Credit Reporting Act (FCRA). That means no double-dipping. If you get a consumer report for one purpose, don’t use it for a different purpose. 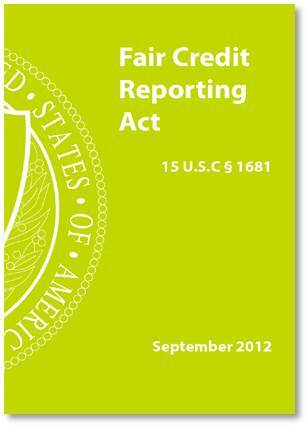 The FCRA applies when you use consumer reports to determine things like eligibility or pricing for credit, insurance, or housing; eligibility for employment, government benefits, licenses, membership in an organization; or admission to an educational institution. If you use consumer reports to make eligibility decisions, make sure you review the Notice to Users of Consumer Reports. Consumer reporting agencies (CRAs) are required to give you this document to inform you of your obligations under the FCRA. Other federal or local laws also may apply to your use of consumer reports. When you get a consumer report, you must certify to the CRA the purpose for which you will use it. You must use the report only for that purpose. For example, that means if you get a report for a membership determination, you can’t then use it to make a credit decision. Or if you get a report to determine eligibility for a government benefit, you can’t then give it to a different government agency to make another eligibility determination. Why is this important? When consumers request copies of their files, CRAs must inform them about who has obtained reports on them. This helps consumers track each organization that has used a consumer report to make an eligibility decision about them. Getting a new consumer report when you have a new purpose helps your business ensure that you obtain the most current information about the consumer. If you make a negative decision about a person based on a consumer report, you must provide the person with notice of the decision – an “adverse action notice” including the name, address, and phone number of the CRA that prepared the report, a statement that the CRA did not make the decision and is not able to provide the reasons for the adverse action, and that the person has a right to receive a free copy of the report within 60 days and dispute inaccurate information. The adverse action notice may be provided orally, electronically, or in writing. A written adverse action notice is best because it provides proof of compliance. The CRA that provided you with the consumer report may have a model adverse action notice. Finished with the report? Once you no longer need it, you must securely dispose of the report and any information gathered from it. How is it right that company are employees can use / say that they don't go back no further the 7 are 10 years on your criminal record. Then has you to disclose your record voluntarily. And if you don't you want be considered for the job . If you do , then they use the credit report and your records against you . The double dipping rule comes into play but shouldn't it be discrimination as well ? What about companies that are posting mug shots on their websites that are available to anyone who does a search and reviews the images that come up? I was fraudulently arrested, the case was vacated & quashed, I have no criminal record whatsoever, and yet my mugshot is appearing in image searches! How are these companies obtaining the mugshots & are the cities/counties selling them to these companies? I understand that I can pay to have my mugshot removed that was with two different companies, but isn't this a form of extortion? I know other people that this has happened to who were also found innocent. Would this also be an invasion of privacy? This has got to stop because it is ruining people's reputations & lives! The companies that are showing your mugshot must remove it if you make the request. I am unsure how they can charge you and would recommend contacting the FTC. Employers using such websites are not complying with FCRA requirements as the information they are using must have a process for consumers to dispute. For what its worth, I am sorry what you are going through as it sounds like a nightmare. To get a free credit report, consumers should visit www.annualcreditreport.com. How do obtain a list of my complete work history? I've been working since I was 14, and have had a lot of jobs. Some of those jobs I've worked are no longer in business, and I find it difficult to recall the exact dates of my previous employment. I've had to guesstimate on the dates, and I'm concerned about that causing an issue with a future employer. I just want to make sure I give accurate info on past employment dates. Sorry, Josh. I'm not aware of a site or service where that information is compiled. You get your lifetime employment history from the Social Security Administration at www.ssa.gov. I passed a background check and was scheduled for orientation when I got a call saying I could not be hired because my name was on some blacklist. Some internal list of the company. Since I was denied employment shouldn't I be afforded the same requirements to dispute this? Is it legal for them to run my personal info without my knowledge and signature?